The time has come.... I really can't believe it. 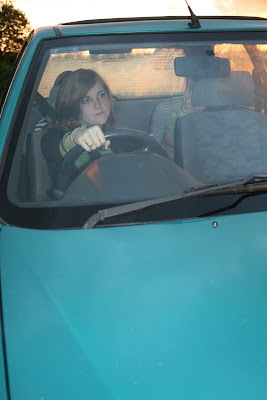 Harriet, my middle daughter, has reached the age at which she can legally drive. It was with a mixture of excitement, nervousness, sadness and trepidation that I took her for her very first drive in 'Peas'(so called because. not only is it bright green, it's registration has the letters PEAS in it.. how cool is that?) her little car. We had two extra (brave) passengers - Harriet's sister and friend - as we set off to find a VERY quiet, secluded spot for the adventure of a life time... possibly our last!! On arriving at our destination Harriet and I swapped places, strapped ourselves in, double checked that the belts were in good working order.. and the lesson began. Considering that she has never been behind the wheel of a car before, except to pretend that she could drive, Harriet did really well. Finding the biting point and pulling away we were off, round and round the car park!! All was going well until Harriet felt that she was losing control, so what did she do??? Well, instead of gently braking she pressed a little harder on the accelerator.. this caused much screaming and hysterical laughing from the back of the car, and very high pitched instructions from me... getting more and more frantic as we headed towards the beautiful Devon bank!! Stopping a few inches from the bank a little voice in the back was heard to say.."I saw my life flash before my eyes!!'.. we all fell about laughing.. with relief!!! Needless to say we did all survive and Harriet has definitely got the bug!! Ahem!! Would you let this person out on the roads??? Anyway.. that's enough of that!! I don't think I'm really ready to accept that my small person is old enough to drive and will soon be running herself around.. I do love being a mummy and being needed. It's not easy to let go is it? I have had a really successful day today trying to find some things to use for my jewellery display at The Great Create. It feels like the look that I want is really coming together. I went to a local flower wholesaler and found these beautiful fake flowers, tin jug and small buckets. 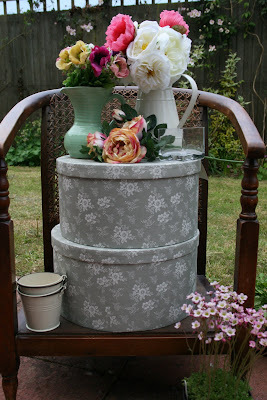 The hat boxes were from a shop in Totnes and are really beautiful. I am so pleased with my purchases today. I love the colours and textures.. I just had to show you. Little things make me very happy!! Harriet looks perfectly normal to me, just like the rest of us crazy girls!!! Hi again... I'm on Aucklands North Shore, home to more gorgeous beaches than you can throw a hat at. The age for driving here is 15, can you believe it? I've got one driving already and a son who is already planning the first lesson in six months time...luckily my car's an old Beatle that doesn't do much more than 40, street cred 0 but safetywise 10/10! 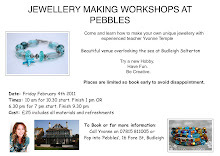 I like the displays for your jewellery, I would love to get along to see The Great Create. I always remember my boys learning to drive, you realise then they have grown......into very lovely people. They grow so quickly don't they,I look at my two and sometimes feel a little sad that they are growing up and getting further and further away from needing me. I love the flowers and boxes as well. Your post got me remembering my first driving lesson (quite a few years ago now :) I bet your daughter was so very excited! Love your little finds for your jewels too, really pretty! Thanks for visiting my blog! So you're in Devon too!! !And such a beautiful part! You were brave taking your daughter on a driving lesson. Pleased that you all emerged unscathed. LOL. Like your collection of props for the great Create. Thanks for stopping by my blog the other day, your always welcome. I look aweful in those photos! I desperatly need a trip to the gym! Can't wait till i pass! Seems a long way off at the moment!